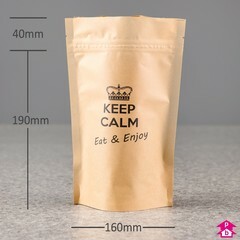 A fun variation on our plain brown biopaper stand-up pouches. 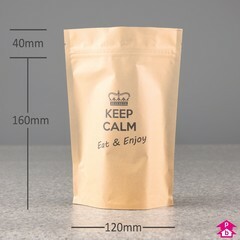 These printed versions of the brown biodegradable pouches follow the classic 'Keep Calm' design tradition. 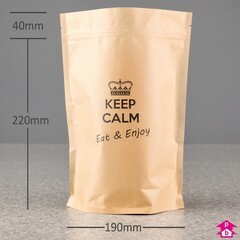 Printed in black ink the pouches feature a crown and the words 'Keep Calm Eat & Enjoy' on the front with a bio logo and 'For a better world' on the back. When placed into a composting environment will biodegrade to compost within 3 months. 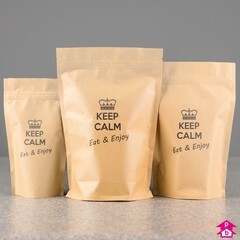 Bottom gusseted base allows the pouches to stand up independently on the shelf. Header can also be sealed with a standard heatsealer.